I love having books in the home, especially ones that are packed full with interesting stuff, especially facts - everyone loves facts. The kids love reading different facts and discovering and being amazed all at the same time, and this book by Tracey Turner does just that. 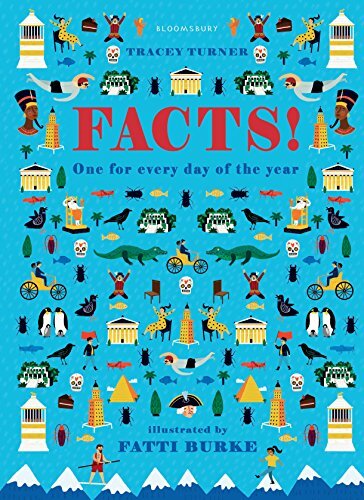 It's a visual, fun book full of facts - infact, one fact for every day of the year. Did you know that not all blood is red? Lots of creatures have yellow or green blood, including the Yellow-footed, green blooded skink (a type of lizard), and cockroaches, which have white blood! Wow, how interesting is that!! Now we are attempting to read one each day, remaining on the actual date. So today, the fact is about the worlds fastest roller coaster, the Formula Rossa, which has a top speed of 239kilometers per hour - eekk. I love these types of books, they are interactive where they bring people together, read and experience it together. This is the type of book when you have friends or family round, you can pull it out and have fun. You get to explore a world of topics, from hilarious animals to unbelievable-but-true science facts, mind-blowing space stats, to incredible human achievements.